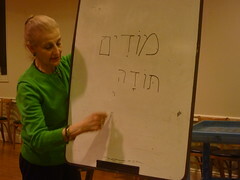 Hannah Rubenstein Carol Green, a religious instructor at the Town and Village Synagogue, teaches Hebrew to a group of adult bat mitzvah students. Although becoming a bar or bat mitzvah as an adult is hardly novel, the synagogue’s program is distinct because its participants undergo the ceremony as a group rather than independently. After the last syllable fades away, the teacher breaks into a wide smile. At this rate, the students will surely be ready when the time comes to stand at the bimah and read the Torah in front of the whole congregation. Years of study have prepared them to become bat mitzvahs, to be recognized and welcomed into the Jewish faith as independent adults. There is only one difference between these students and others around the world studying to become bar and bat mitzvahs — these are not boys and girls, nervously approaching their 13th and 12th birthdays, respectively. These are women between the ages of 20 and 80. This bat mitzvah class is for adults only.